*Special offer free Jacuzzi 10th-20th April, not restricted to Saturday to Saturday for cheaper flights, Book now to avoid disappointment* Stunning 3 Bed Ground Floor Apt With Stunning Views Of Slopes & Private Jacuzzi, Our Chalet is located in Courchevel Le Praz is excellently situated with one telecabine lift, the Praz telicabine and a new fast chair lift, La Foret, the ski lifts are located less than 50 metres from the apartment and we have one of the very few apartments you can ski to and from the lift and slopes from your door, this is a fantastic luxury to have not needing to carry your skis after a long day on the slopes.The Apartment has it's own private parking for your car. The Praz telecabine lift takes you directly into the centre of Courchevel 1850 in less than 10 mins. The Foret chair lift takes you up towards the summit of "La Loze" at 2196m, giving easy access to the wonderful skiing of Courchevel / La Tania or the Meribel valley and Val Thoren valleys. The Courchevel ski area links in to the massive 3 Valleys ski area..Skiing to Le Praz is a breathtaking experience in itself. The tree lined pistes down into Le Praz are some of the prettiest runs in the three valleys ski area. The jockey’s black run into Le Praz is one of the famous runs in Europe, Jockey’s is directly in front of the apartment and takes you straight to the apartment door, there is also a steady red run down Brigues that also takes you directly to your door, also a lovely gentle red Murete which is pisted everyday bringing you directly to the door. Le Praz also has it’s own nursery slope situated directly in front of the apartment no further than 20 meters away, it has the only free lift in Courchevel and the drag is open 9pm-1pm 2pm-5pm everyday, the slope is also great later on for a bit of sledging fun! Le Praz boasts a good selection of lively bars, mouth-watering creperies and fine restaurants including "Le Bistrot du Praz", one of the most famous restaurants in the 3 Valleys. There is also the Darbello and the S Courch Sports bar that serves excellent pizzas and have a host of live bands playing and show all the major sporting events in English. The S Courch is 100 metres from the apartment. Le Praz has a selection of local supermarkets and shops less than 50 metres from the apartment. Courchevel Le Praz, truly Savoyard in character, is definitely the prettiest of the four Courchevel villages. A quaint village square, rustic chalets and narrow cobbled streets create a traditional French village ambience. The traditionally good snow, north facing slopes and extensive network of snow cannons enable you to ski back to the village throughout the season. For those wishing to stay behind for an après ski drink in one of the sophisticated bars of 1850, a free ski bus service operates to bring you down (until 1:00am every night). There is free ski bus, which you can use with your lift pass, which runs every hour and links Le Praz to its neighbouring Courchevel stations. These are La Tania, Courchevel 1550, 1650 and 1850 (takes about 15 mins to 1850). This runs all day until around 10pm at night, This is perfect to be used for the 1550 night toboggan run into Le Praz, and of course to go to the famous Aquamotion, which hosts a huge indoor/outdoor water park and pool, rock climbing and many more activities. The chalet itself has exceptional outside space with unique views, as it has nothing in front or behind it. It sits at the bottom of the Olympic Jump which is beautifully lit up on an evening , and its own private garden space which includes entertaining area and large, private jacuzzi, perfect for a glass of fizz whilst taking in the views after a long day. The apartment itself is a mix of contemporary styling with traditional themes, a truly alpine masterpiece. The Ski lift is just a cross from us, we have a gorgeous view of the Olympic ski jump that you can watch all the skiers and events from the patio which holds a 6 person Jacuzzi, it has 1 bed and 5 seats. There are lots of events to watch from the patio the torch lit decent by the ski instructors, the Christmas sleigh ride is just on the ski slope in front of the apartment 10 m away. There are also massive firework displays that are done over the lake just next to the le praz bubble 50m away. There are wonderful pre drinks parties in the village new years eve, or even banquet meals to have, Christmas and new year is such a lovely time to enjoy our apartment on the slopes. Large sofas, open fire, large flat screen tv (large selection of UK channels) with in built surround sound and dvd player. Breakfast bar with seating for 4, fridge freezer, dishwasher, oven, hob, inbuilt microwave, espresso machine. The whole of the three valleys is easily accessible from this property. This place is really beautiful inside and out with fabulous facilities and the location was stunning. We have rented several places in the three valleys some more expensive than this but this chalet was beautiful. The layout of the place is really open plan in the dining/ living area and the interior styling and furnishings are more akin to an expensive boutique hotel than a privately owned chalet. We loved the fact that the terrace is perfectly placed to enjoy the views of the ski jump as well as the village and lake and the hot tub was a fantastic facility and we sat out in it during the day and enjoyed the fresh air and views. 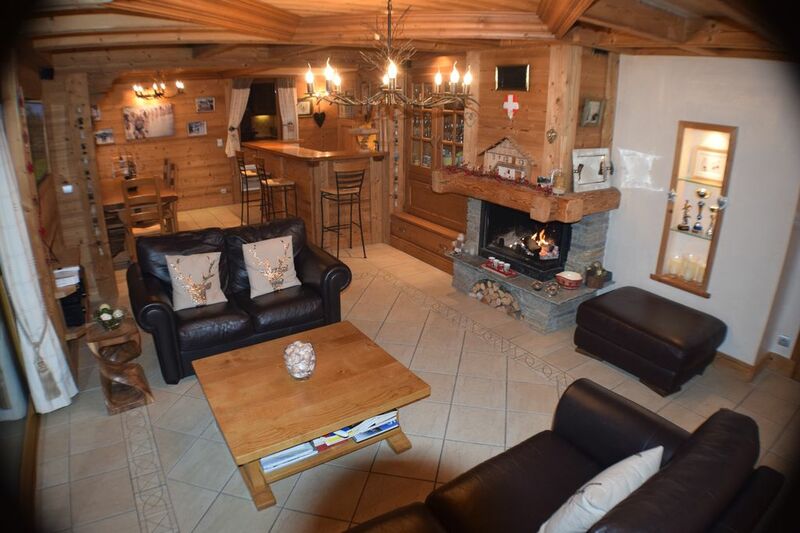 The chalet is a 2 minute walk to the centre of the village and the lake as well as being well placed for walks either down through the village or up to La Tania or across to Mirabel Village depending on your appetite for distance. I don't usually write reviews but we had such a lovely holiday in that I felt I should make the effort. Hmm, very mixed review on the property. Initially good contact with the owners when enquiring and asking for details, but once we decided to book and pay, it seemed impossible to contact the owners, I must have emailed 6 or 7 times on top of phone calls and messages. I wasn't exactly sure of the reason, but when we finally got in contact they were very apologetic, and I was grateful for that. On arrival to the chalet we discovered that no keys had been left in the key locker for us to get in (quite a difficult thing to comprehend that hadn't been checked prior to us getting there) we called a local friend of the owner and she arrived quite quickly to let us in as it was snowing heavily at this point. Unfortunately we were only given a key to the side entrance (ski locker was through a different door) so we had to walk around the building each morning to use the locker (a key was found around midweek so we could use the ski locker easily). After all of this was done, we could step back and enjoy a beautiful chalet, decoration and feel was great, location was perfect and the ski area spot on. Local shops and services provided everything you need. The wifi was massively intermittent we were a little bored on our as the TV system wasn't explained. When the trip was finished we were sorry to be leaving, even sorrier when I wasn't contacted after we left in regards to the security deposit. I left it 2 weeks before getting in contact (again a couple of emails and phone calls required, to be told there was a problem with the deposit. Kerri didn't know the details so she said Chris would contact me to let me know, it has been 2 months now, I have emailed 3 times and called twice, my deposit is nowhere to be seen. Like I said "Ups and Downs", the chalet is great, the location is great, the other bits....slightly disappointing to shockingly bad. The Ski lift is just a cross from us, we have a gorgeous view of the Olympic ski jump that you can watch all the skiers and events from the patio which holds a 6 person Jacuzzi, it has 1 bed and 5 seats. There are lots of events to watch from the patio the torch lit decent by the ski instructors, the Christmas sleigh ride is just on the ski slope in front of the apartment 10 m away. There are also massive firework displays that are done over the lake just next to the le praz bubble 50m away. There are wonderful pre drinks parties in the village new years eve, or even banquet meals to have, Christmas and new year is such a lovely time to enjoy our apartment on the slopes. Booking Notes: Please contact owner for booking form and terms and conditions. Jacuzzi charged at an additional £250 per week should you require it Changeover Day: Please contact owner. Notes on prices: Please note, additional charges will apply for use of jacuzzi.